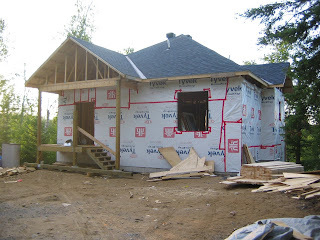 Cottage on the Edge - the DIY Cottage Blog: Roof is ON!!!! The entire roof - sheathing and shingling was completed on August 4th. The shingles we ended up using are a style called Cambridge 30. the '30' specifies the warranty period. The colour is national Blue. These shingles are made by IKO Canada. This style of shingle simulated the look of cedar shakes - we are very happy with the look! Also in this picture you can see that two roof vents and two waste pipe vents were installed. The waste vents actually don't connect to anything yet - they are just 3-foot pieces of pipe just to fill the waste vent flashing that was installed. The interior vent pipe will be installed and connected when the plumbing goes in. The roof vents we used are called 'Maxavent'. It is very important to understand how attic cooling happens and that you install the right kind of and right size of roof ventilation for your roof. A single story at this cottage is 840 square feet so we used two vents installed right at the top. The second part of the venting system is to ensure there is sufficient air flow in to the attic from the bottom edge of the attic. We accomplished this by using vented sofit around the entire roof.